We specialize in creating custom paddling adventures for K-12 schools, colleges, summer camps and other youth and student groups. Our trips for students are always safety-conscious, fun and educational. Our expert guides teach participants paddling basics, and they are also prepared to share their knowledge about a wide range of topics and find creative ways to stir students' curiosity. Thank you! We will get back to you shortly by phone or email with more information. Also feel free to contact us directly at 207-370-9730 or portlandpaddle@gmail.com. A brief sea kayak tour allows time for a lesson in basic paddling techniques and a cruise along the historic waterfront of Portland harbor. We'll look out for seals and seabirds and talk about the many ways that the shoreline of Portland has been used and shaped by humans over several centuries. We'll spot lighthouses, forts, marine observatories, working wharves and ships from all over the world. This is a great option for groups of all sizes that have limited time and/or limited budgets. A brief Stand-Up Paddleboarding (SUP) lesson is another great option for groups looking for a fairly quick adventure. SUP is a sport that's incredibly fun and can be fairly easy to learn. Our expert staff will start the group off with a paddling lesson and then lead the way on a cruise along the coastline of Portland harbor. Along the way we may find a chance to learn some SUP yoga, play some paddling games or observe seals and seabirds. Students should expect to get wet when paddleboarding, so warm layers and a change of dry clothes is essential. If your group is up for an adventure of three hours or longer we can arrange a paddle to Fort Gorges, an abandoned mid-19th-century structure on a tiny island that is one of the most popular paddling destinations in Casco Bay. We'll share with students the fascinating history of the fort's role in American history and we'll lead them on a tour of its beautiful grounds. Some groups plan to have a picnic or snack at the fort, and we are happy to provide dry bags for you to pack food. Alternatively, for an extra fee we can provide a picnic lunch. This trip is a unique mix of sea kayaking, island exploration and time travel into the 19th-century! Many groups make a full day with us by spending half the day sea kayaking and the other half of the day paddleboarding, with a beach picnic break in the middle of the day. The two experiences tend to be very different, involving distinct skills and allowing for different ways of interacting with the marine environment. A kayak or SUP trip at Crescent Beach State Park allows you to combine a visit to one of the state's most beautiful beaches. The state park is located in the town of Cape Elizabeth and is a 15-20 minute drive from downtown Portland. Many of our trips departing from the state park head to a rugged, forested island facing the open ocean with pristine beaches. During the paddle to the island we look out for the area's abundant wildlife (seals, osprey, seabirds) and enjoy the views of the lighthouses at nearby Two Lights State Park. Once we reach the island we land on a beach and follow a trail to a view of the open ocean. Casco Bay is filled with terrific islands for kayak camping. We offer a range of regularly scheduled overnight trips to these islands and we're always willing to create a customized trip just for your group. We often work with teachers to create trips that can align with a class's curriculum. Visit our Overnight Trips webpage for more information. Our guides are experts at crafting fun and safe paddling experiences that take advantage of opportunities for students to learn about the history of the Maine coast, marine ecology and the sports of sea kayaking and paddleboarding. 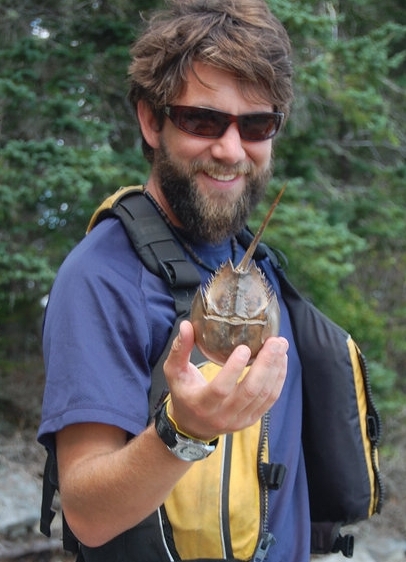 MARINE ECOLOGY: As we paddle through coastal environments that include rocky intertidal zones, sandy shores, salt marshes, oceanside forests and remote islands we’ll seek out opportunities to explore the science of the ecosystems we encounter. We’ll keep an eye out for easily visible organisms like seals, seabirds, barnacles and seaweeds as well as considering the role of less visible ones like the many planktons that are so crucial to life in these waters. We’ll observe the changes in the tides, currents and weather both to predict the paddling conditions and to discuss how those forces shape and define the marine environment. THE GULF OF MAINE: The Maine coast borders a massive, environmentally unique body of water called the Gulf of Maine. Learning about the Gulf of Maine is a great way to learn more broadly about the world’s oceans and the environmental changes they are currently facing. The Gulf of Maine is one of the fastest-warming bodies of water in any ocean, making it a particularly good jumping off point for any conversation about climate change and the related topics of sea level rise, ocean currents and ocean acidification. THE NEW ENGLAND FISHING INDUSTRY: The presence of the fishing industry -- and especially lobstering -- is everywhere along the coast of Maine, and our trips offer plenty of opportunities to learn up-close about the fishing profession and the way of life that goes along with it. We’ll watch loberstmen at work and learn about the New England fishing industry’s centuries-old history and its environmental impact on the Gulf of Maine. AMERICAN HISTORY: Our paddling trips often present opportunities to discuss the indigenous peoples who once occupied Maine’s coast, the Europeans who colonized these lands and the many chapters in the evolution of the United States that played out here. We’ll see Abenaki shell middens, sites where English fishermen cured their cod in the early 1600s, lighthouses commissioned by the nation’s founders, forts built during the War of 1812, remains of one of the first lobster pounds, submarine towers built during WWII, schooners that are replicas of 19th-century tall ships and much more. MARITIME NAVIGATION: During our trips we rely on nautical charts and compasses to navigate a route through the dense chains of islands that run along the Maine coast. This presents an opportunity to introduce participants to these maritime tools and techniques and to even give them hands-on practice honing their newly-learned skills. It’s amazing how much more you know about a stretch of coast when you are able to interpret it on a nautical chart. Learning about navigation also offers opportunities for lessons in geography, astronomy, math and other related topics. THE CULTURE OF MAINE’S ISLANDS: There are thousands of islands on Maine’s coast and many of them have been inhabited for hundreds of years. The islanders’ way of life can be a window into another era in history and a lesson in modern resilience and adaptability. Visiting these islands offers a chance to learn about the unique culture of these rugged, remote environments and the people who call them home. 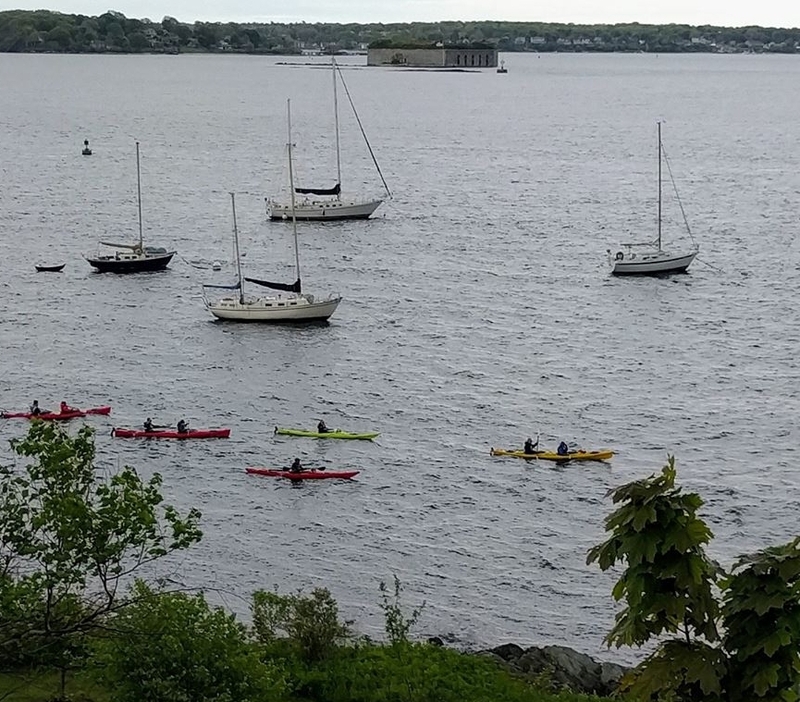 GLOBALISM AND INTERNATIONAL TRADE: The wild stretches of the Maine coast we paddle may seem like an odd place to learn about global trade, but we’re usually traveling along international and local shipping routes that for centuries have been central to the global economy. These days we witness container ships, oil tankers and cruise ships passing in and out Portland harbor but we can also imagine the triangular trade routes of the 18th and 19th centuries that made Portland prosperous and that fueled the rise of global capitalism along with, tragically, plantation slavery. MAINE LITERATURE & ART: Many of the places we visit are tied closely to an artist or author whose works have the potential to enrich our experience. We might consider reading excerpts from Henry David Thoreau, Rachel Carson, Ruth Moore, or Edna St. Vincent Millay; or we might view paintings by Winslow Homer, Thomas Cole or Andrew Wyeth that speak to the places we’re exploring. These are just some of the areas we enjoy exploring with participants on our trips. Tell us if there’s a particular area of focus you’d prefer for your group. We’re happy to work with you to ensure that your trip meets your group’s goals, interests and expectations.